Below you will find information and the particular options we offer for building the perfect saddle for you. All saddles and options are based on our standard or "Base Price" saddle. 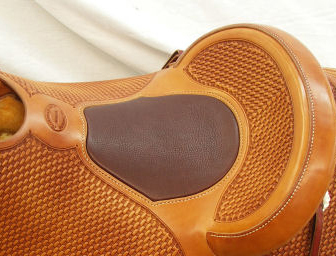 Please click on the interactive links for detailed photos of the saddles/options. If you don't see what you're looking for here please also visit the Gallery page where there are several examples of our work. If you are ready to order or simply have a few questions please call, we would like to visit and discuss your order to make certian we build the perfect saddle to meet your needs! 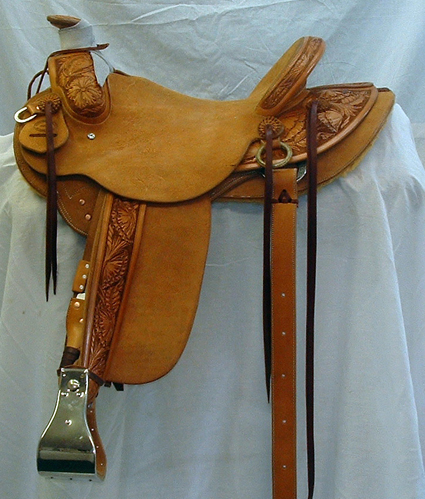 Seat Size: 15", 15-1/2", 16" or 16-1/2"
Includes - tooled swell, gullet, cantle back, skirts, and back jockey, rear billets. Roughout seat and fenders. Includes - tooled swell, cantle back, gullet, back jockey. Roughout seat, fenders, and rear billets. Rawhide Braided Rings $25 ea. Custom 1-1/2" Conchos Starting At: $100 ea. Our wade saddles are built on the original wade patterns and are built by one of the finest tree makers around. We use only the fines raw materials available to use. We strive to bring you the finest in horse gear. Please pay careful attention to these measurements when ordering your saddle. Our Saddles Feature only U.S. Made Hardware. The Highest Quality Available.